What's done in Clickwork version 1.5 (beta11) since version 1.4. The structure of the activities table will be updated and will no longer be recognized by version 1.4. This implies that you should use the 1.4 backup of the application and the data when downgrading from 1.5 to 1.4. The INI file has new sections that handle all user access. 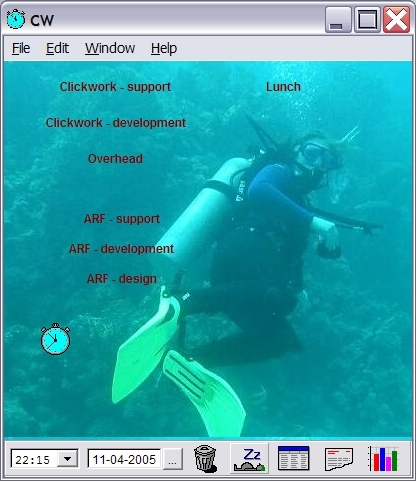 The INI file can now be modified from within ClickWork and with an external editor. The Tip texts have been completely revised and are now all access-profile sensitive. An activity can now be categorized in the New Activity window. Several options for activity buttons can now be set in the New Activity window, like fixed autostart and autostop, and idle autostart and autostop. Manager Mode implemented. A 'manager' has the right to view and manage the data of a span of users. This enables the manager to produce multi-user reports and graphs. Also, the manager can build a predefined Activities List. Users can choose from this list when creating an activity button. The list boxes in the Options window were of the wrong type. When resized to a very small frame, the Table window would let crash ClickWork. A minimized main window did not always properly 'restore' when the button in the taskbar was clicked. The info about the background picture would get lost if a user would occasionally start from another pc where the picture is not available. Help text corrected: Cleanup of obsolete records only cleans up the own records. Moreover, it requires that the user is the only current user. Week numbering was not according to ISO 8601 since week 53 of 2004. Now the preferred way of numbering weeks can be set in the Options window. Default is ISO. The Nominal Date on the detail report 'Group On: Activity,Subactivity' was not always redisplayed on a new combination of activity and subactivity. The About window was resizable. Moving the toolbar from top to bottom or vice versa now also repositions the activity buttons. EditNote methodology changed. It is now an option in Main>Edit and its menu has been revised. Furthermore, it is now also an option in the Table window's Edit menu, but that one is slightly different in behavior. When modifying records in the Table window, no longer the whole table is locked, but instead each record of the user is locked just-in-time, that is, on entry of the record. This implies that other users, when clicking an activity button, are no longer confronted with a blocking message due to such a table lock. The readwrite Data Map is the new home for the INI file. The technical info, as can be sent via the Contact window, has been enhanced.